Attacks on Pope Benedict XVI’s decision to lift the excommunication of a Holocaust denier escalated Monday, with one theologian calling on him to step down as the head of the Roman Catholic Church. Criticism following the pope’s January 24 announcement has been particularly cutting in Germany, where denying the Holocaust is a crime punishable with a jail sentence. “If the pope wants to do some good for the Church, he should leave his job,” eminent liberal Catholic theologian Hermann Haering told the German daily Tageszeitung. “That would not be a scandal, a bishop has to relinquish his position at 75 years, a cardinal loses his rights at 80 years,” he said. Pope Benedict is 81. Back in Germany, high-ranking Catholic officials said the pope risked losing vital support. “There is obviously a loss of confidence” in the pope and “rehabilitating a denier is always a bad idea,” the bishop of Hamburg, Werner Thissen, told the daily Hamburger Abendblatt on Monday. The bishop of Rottenburg-Stuttgart, Gebhard Furst, meanwhile spoke of his “uncertainty, incomprehension and deception” in the national Bild. PARIS, FEB. 2, 2009 (Zenit.org).- The archbishop of Paris says the denial of the Holocaust by a Lefebvrist bishop is a cause of horror, but that the issue at hand is not his successive apology but the facts of the Shoah. The lifting of his excommunication — which happened shortly after the interview was aired — was called an affront to Jewish-Catholic relations, though the Holy Father made clear that his motive in removing the excommunication was the advancement of Church unity. In papal commentaries and in statements from the Vatican spokesman, it has been reiterated that the Church does not share the bishop’s views. I do not expect the Pope to resign over this. To the contrary, I expect him to keep working to bring the Orthodox and others claiming to be distanced Catholics into unity with Rome–which is something that the Orthodox should not do (see Orthodox Must Reject Unity with the Roman Catholics). Perhaps it should be mentioned that if certain Catholic prophecies apply to this pontiff (see One More Pope? ), he would not actually resign but ultimately may leave Rome. 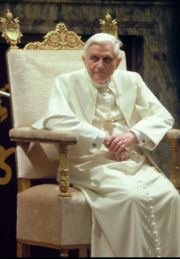 But even if those prophecies do not apply, I do not believe that Pope Benedict XVI will resign over the current matter. This entry was posted on Tuesday, February 3rd, 2009 at 11:21 am	and is filed under Religious News.